Christian Dior was the indisputable leader of French fashion during the 40’s and 50’s. His designs would be sold worldwide only a short time later with the wildly popular New Look design that changed the silhouette of women’s clothing. Dior was born and raised on the Normandy coast of France but moved to Paris with his family shortly after. At a young age, Dior’s passion for drawing was evident and he sold sketches outside of his home for 10 cents. Dior’s first true business venture was a small art gallery in Paris which was funded by his family. When the family’s business failed Dior was forced to close down the art gallery and began to sell his fashion sketches to design houses across France. 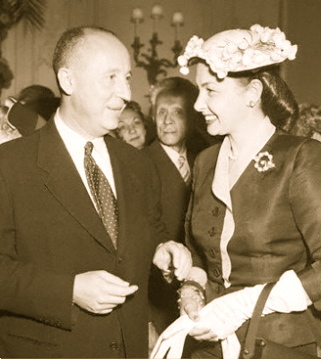 He was employed by several couture houses throughout the early 40’s until 1946 when fabric magnate Marcel Boussac financed the opening of Dior’s fashion house. Dior’s first collection, originally named Corolle, was renamed New Look by Harper’s Bazaar’s editor-in-chief Carmel Snow. The New Look silhouette was a drastic change from the World War II fashion that had been boxy and scarcely put together during wartime rations. The New Look silhouette was round-shouldered with a tight waist and a full skirt. Dior was correct in assuming that women were ready for a change in fashion and his fashion house was inundated with orders for the New Look. Dior was sought after by celebrities including Rita Hayworth, Marlene Dietrich and Ava Gardner. In addition to clothing, Dior and partner Jacques Rouet expanded the business to include furs, socks, ties and perfume. Dior and Rouet were pioneers in the fashion business for being the first fashion house to provide license agreements for their products. After the sudden death of Dior in 1957 Yves Saint Laurent became head designer of Dior until 1960. Dior’s head of design was John Galliano, a former designer for Givenchy and is believed to have a style very reminiscent to that of Dior’s original style in the 40’s. He designed feminine pieces and believes in luxury and freedom as a principle of design.